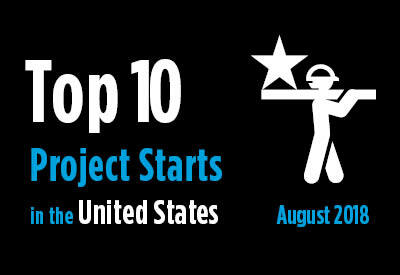 The accompanying table records the top 10 project starts in the U.S. for August 2018. Click here to download the Construction Industry Snapshot Package – August 2018 PDF. Click here for the August 2018 Industry Snapshot article, ConstructConnect’s August Nonresidential Starts Were -19% M/M, but only -2% YTD. Click here for the Nonresidential Construction Starts Trend Graphs – August 2018.